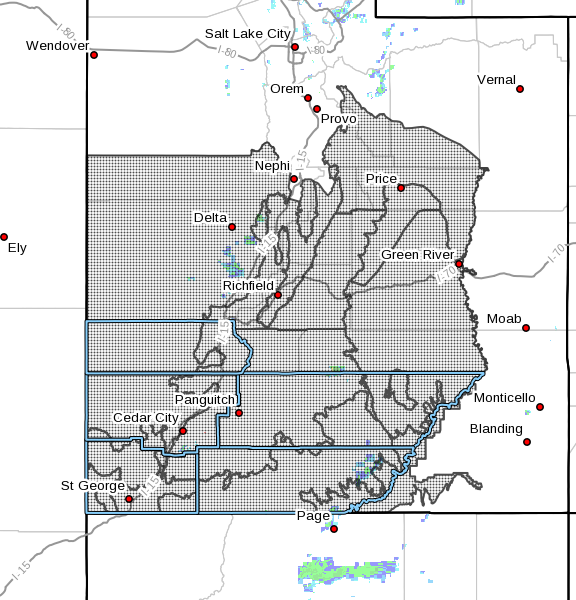 SOUTHERN UTAH — The National Weather Service in Salt Lake City has issued a flash flood watch for most of Utah in effect noon Monday until Tuesday evening as showers and thunderstorms capable of producing heavy rainfall are expected Monday across the area. Wasatch Plateau/Book Cliffs, Castle Country, San Rafael Swell, Sanpete/Sevier valleys, west central Utah, southwest Utah, Utah’s Dixie and Zion National Park, South Central Utah, Glen Canyon Recreation Area/Lake Powell, central mountains, southern mountains, including the cities of Scofield, Price, Castle Dale, Emery, Green River, Hanksville, Manti, Richfield, Delta, Fillmore, Beaver, Cedar City, Milford, St. George, Kanab, Escalante, Bullfrog, Cove Fort, Koosharem, Fish Lake, Loa, Panguitch and Bryce Canyon. From noon Monday through Tuesday evening. Showers and thunderstorms capable of producing heavy rainfall are expected this afternoon and evening across the area. The threat for heavy rainfall will continue into the overnight hours, with additional showers and thunderstorms expected Tuesday afternoon and evening.